on New York City and Washington, D.C. The astonishing images of the collapsing World Trade Center in the aftermath of the September 11, 2001 terrorist strikes are some of history's most horrifying. 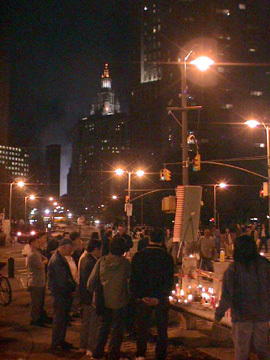 Beyond the terrible toll of lost lives, the attack shattered the confidence of modern capitalist society. Life goes on for New Yorkers and Americans, but differently and now the daily threat of terrorism that has haunted Israel and England for decades is palpable in the United States. Had the terrorists merely blown up the Statue of Liberty or the Washington Monument, the outrage would be enormous, but the toppling of the gleaming twin towers of the World Trade Center not only demolished one of the great physical icons of the world's financial center, but its carnage also catapaulted the American psyche into trauma, closing the financial markets and the nation's airports as well as sealing off Manhattan. No mere disruption or inconvenience, the strikes broke complacent routine. 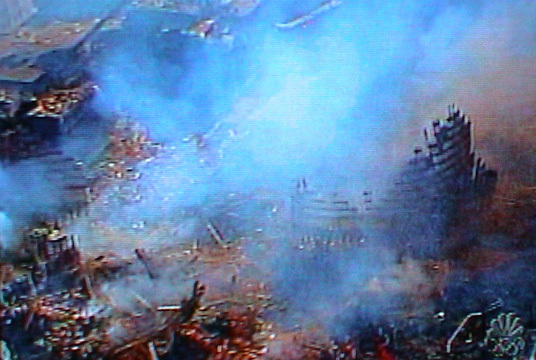 The televised "incidents" were perhaps even more shocking than the Japanese sneak attack on Pearl Harbor in World War II because they continued to occur on live national television, unleashing frightful, indelible, surreal and incredible images whose drama was perhaps more vivid than any other in history. The images of the explosions of atomic bombs, the firebombing of Dresden, and the smoking chimneys of the German concentration camps almost pale in comparison. Stark but black-and-white, they were not so explosively colored. Here, in crystalline sunlight, the shiniest manifestation of the man-made environment was obliterated. One thinks of "the humanity" that engulfed a reporter's emotions as he witnessed the Hindenbergh tragedy. 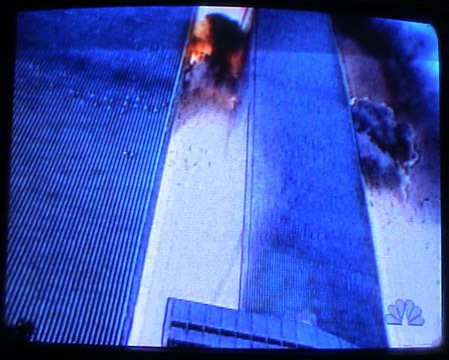 Remarkably, the second attack on the World Trade Center was very well documented in amateur videos and one in particular, which showed a jetliner smoothly penetrating one façade of one of the towers and bursting through another, was amazing and mesmerizing as it was shot with the camera pointed upwards with a man seated at the lower left slowly realizing that something horrible was happening way above him. The playback of this video on national television at a slow speed was spell-binding, but excruciating - the split-second suddenness of the realization of violence and death was magnified and timeless, scientifically precise and very, very heart-breaking. The attacks were successful beyond any terrorist's wildest dreams and, tragically and sadly, it did not come as a surprise. Indeed, the World Trade Center had been damaged at its base by a terrorist bombing in 1993. 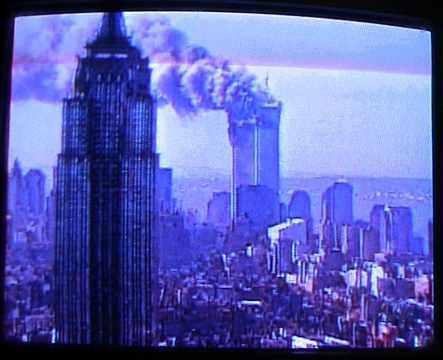 The world has been living in fear of nuclear war for almost half a century and certainly natural catastrophes have taken larger tolls, but the September 11, 2001 attacks were extremely stressful for a country that has managed, to a great extent, to escape great suffering since the Civil War. Certainly the blitz in London, the terrorist IRA bombings in England, the "battle" for Algerian independence and the ongoing violence in the Mid East hardened those populations to the fragility of the human condition to a much greater extent than most Americans have been accustomed. Glorious special effects in movies and a violent video and computer game culture and inane tabloid television have inured much of the United States to the agonizing reality of the real world, which is much more painful than the virtual. Living in, and with, fear is not easy. While events such as these inevitably unleash vindictive thoughts, their importance transcends the very great suffering and anguish of those who perished or were injured and their families. 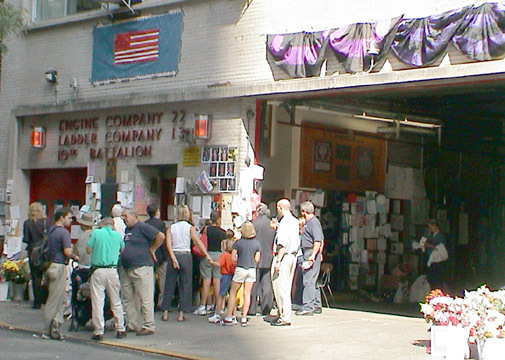 Front of New York City Engine Company 22 and Ladder Company 13 in Manhattan on Friday September 14, 2001, has makeshift memorials to victims of terrorist attacks (photo by Michele Leight) It lost Firefighter Martin McWilliams in the terrorist attack and eight more men are missing: Captain Walter Hynes and firefighters Thomas Casoria, Michael Elferis, Thomas Hetzel, Vincent Kane, Dennis McHugh, Thomas Sabella and Gregory Stajk. Contributions can be made to "Eng 22/Lad 13 Firefighters Family Fund" and sent to Engine Co. 22/Ladder Co. 13, 159 East 85th Street, New York, NY 10028. These events are sobering, rude awakenings to realities that are extremely challenging. It is cavalier to assume that such terrorism is merely the outlandish acts of a few madmen. The lead editorial in the September 12, 2001 edition of The New York Times bore the headline "An Unfathomable Attack." It was no more "unfathomable" than the napalming of Vietnamese children by American bombers. The right adjective is "unconscionable." The kamikaze sacrifice of the terrorist perpetrators is, in their culture, heroic, albeit misguided, wrong and evil. Traditionally, terrorists have justified their actions by the alleged need to dramatize their cause with limited means. Assaulting "innocent" people, as opposed to uniformed "combattants," is not gentlemanly, not honorable, but to quote Brutus are we not all honorable? There are niceties of decency, of course, but there is evil, there are unforgivable actions, there is a need for justice, and war is simply legalized terrorism and terrorism is war. The terrorist causes are not as important as the root of their frustrations and anger. While the perpetrators are not yet known, there can be little question that religious fanaticism that seeks to stamp out "infidels" is a large, very large, part of the problem and that such attitudes are intolerable in the modern age. Indeed, they are ignorant, anachronistic, chaotic denials of history and the intellect and what is "unfathomable" is how such attitudes can have survived. Can civilized society stand idly by and permit such attitudes while at the same time exhorting the virtues of freedom? The very painful answer is no. Freedom of thought and belief is inviolate and the most fundamental of American "ways." One can think evil thoughts, but that does not condone evil deeds. Certainly, the terrorist attacks on the World Trade Center and the Pentagon were "despicable" and evil and should not be condoned, ignored or minimized. The resolution of the conflict between freedom and evil, however, cannot be violent retribution and retaliation, but measured justice and, more importantly, a very clear-cut renunciation of the hypocrisy that supports, if not promotes, such perverted thinking. If a group, or country, practices something loathesome and bad, it should not be supported in any way, even if that means there might be economic consequences. If, for example, Arab states wage or support a racist war then they should be boycotted, completely. One should not stand by idly, just as one cannot shoulder the responsibilities of the entire world. In this crisis, as in many others, there are many astounding demonstrations of bravery, selflessness, and dedication to the alleviation of human suffering. Man can be noble. For those who supported these terrorists, the terrorists were very noble, inflicting incredible damage on a horrid enemy: a decadent, greedy, idolatrous America. America, of course, is also the land of the free and freedom must be defended and honored. Decadence, greed, idolatry are serious concerns. Living dialogues not deathly raids should be the objective of those who love and those who hate America. America needs to enlist the support of its allies and all countries in extending the open arms of friendship and toleration and peace and in shutting the door on all who would profit from outrageous acts, all who would incite riotous, deathly conduct. Past wrongs do not justify new ones. We do not live in a perfect world. We do live in a human world that needs to be humane, and just. The day after the terrorist strikes New York City was eerily silent and empty, not completely of course, but in comparison with its regular bustle. Mayor Giuliani was superb and admirable in his leadership and remarks and as the hours passed the enormity of the rescue efforts and the dedication of the rescuers grew ever more inspiring. Deeply bruised, the city could take great pride in its spirit. The nation's response was also awesome. The television networks suspended regular broadcasts to devote themselves to round-the-clock coverage. Sporting events were cancelled. People reached out through e-mail when the phone lines were busy. Old friends and family made contact with their New Yorkers. The catacyclism nurtured unity. As usual, Peter Jennings was terrific on ABC News but even his elegant composure was shaken, first by the acrid smell of smoke from Lower Manhattan that on Wednesday night wafted all the way up to the ABC studios on Broadway and 67th Street, and then on Thursday evening when a clip was shown of the Coldstream Guard Band playing the American national anthem at Buckingham Palace at the request of Queen Elizabeth II. Shots of exhausted firemen, of cars covered with photographs of the missing, of American flags, of grief stricken people, were deeply moving. Catacyclism canceled clichés. While the attacks seemed lifted from a Tom Clancy novel and the images of the tidal wave of debris outdid Hollywood's special effects, this was very real and the world seemed much more vulnerable. The Empire State Building, which was hit and damaged by a B-25 medium bomber on July 28, 1945, was evacuated a couple of times because of bomb scares in the weeks following the World Trade Center attacks. Many popular concerns and preoccupations appeared trite. As the moments followed and continued, rage was gradually replaced by the redeeming demonstration of humanity, civic comfort, civil communications, social needs, common sensibility. It has been a humbling, somber experience that has touched everyone. The Wintergarden with its bamboo forest, shown above, at the World Financial Center next to the World Trade Center was heavily damaged. Two weeks after the attacks, it was estimated by city officials that about 6,000 people perished in the strikes on the World Trade Center and the site will probably not be cleared for about a year. Posters of some of the missing in the terrorist attacks on the World Trade Center plasted the walls of 90 and 88 Lexington Avenue near the state armory at 26th Street where bereaved families sought information from public officials. 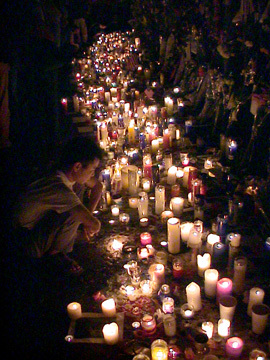 This photograph and the one beneath were taken September 29, 2001 and were all the more heart-breaking because some were stained by the weather and wind and not too many people stood in front of them. To stand before these pieces of paper and read many of them was extremely emotional. These were the specifics, the faces, the names of the lost. These were the haunting, meager memories. In the entrance way to one of the apartment buildings near the armory at Lexington Avenue and 26th Street someone had post a panoramic collage of the view from the top of the World Trade Center observatory, shown above. Some pretty flowers helped, but could not assuage the grief of all who viewed these "missing" posters. In the aftermath of the attacks, American flags sprouted everywhere even as bomb scares became regular occurences, office buildings tightened their security and hotel occupancy fell as tourism and travel diminished significantly. More than two weeks after the attacks, grief and its reminders were not hard to stumble upon, people still asked strangers if they had known someone in the attacks, the soul of the city was troubled. Since its completion in the mid-70's, the World Trade Center has been New York's most prominent landmark and for a very brief while it held the title of being the world's tallest project. The center was initially controversial because of marketplace perceptions that its 10 million square feet of commercial office space would inundate the Lower Manhattan market and depress values, a prediction that was true to a fairly major extent and only partly offset by the grandeur of the project and the new prominence it brought to Lower Manhattan, which had been suffering from a corporate exodus to midtown and the suburbs. Its excavation was used to create 92 acres of landfill just to its west along the Hudson River and that landfill was developed as Battery Park City. Initial architectural plans for Battery Park City envisioned huge and impressive "megastructures" but economics and politics eventually resulted in a much down-sized plan that abandoned daring new designs in favor of more conventional and traditional New York urban designs. While Battery Park City as developed represented a lost opportunity for New York City to reassume the mantle of urban architectectural leadership that it held in the first few decades of the 20th Century, it did create a very attractive waterfront mixed-use enclave that is one of the city's most impressive neighborhoods. Its success was due in large part to the designs by Cesar Pelli for the World Financial Center across West Street from the World Trade Center. The World Financial Center was a five-million-square-foot development of office towers by Olympia & York, a Canadian development company, centered around a spectacular "Wintergarden" that is one of the city's great architectural wonders and opens onto the large yacht basin known as the North Cove. The World Financial Center complex of tall office towers each with different geometric roof forms significantly counterbalanced the tilting of the Lower Manhattan skyline created by the World Trade Center. The Lower Manhattan skyline that originally was highlighted before World War I by the Woolworth and Singer Buildings on Broadway and then sprouted several more great spires in the Art Deco period such as the great towers at 1, 40 and 60 Wall, 26 Broadway, 1 Wall Street and 20 Exchange Place. These great towers, centered in the middle of the lower end of the island of Manhattan created the world's greatest and most romantic skyline. While the World Trade Center would ruin the near symmetry of that skyline, it was the Chase Manhattan Plaza Building that was developed a decade or so earlier that messed up the skyline with its huge bulk. The World Trade Center's design by Minoru Yamasaki and Emery Roth & Sons was an engineering marvel that included "sky lobbies" for transfer to express elevators and a stainless-steel facade that was load-bearing and permitted large column-free spaces on each 1-acre floor of the twin, 110-story towers, which actually are not equal in height. The facade had very narrow windows, only 39 inches wide, to enhance its rigidity even though the protruding mullions somewhat limited panoramic vistas from the towers. The towers shared a vast underground shopping and transportation concourse that included stations of the city's subways as well as the PATH trains to New Jersey. Between the two towers was a handsome medium-size hotel clad in stainless-steel, albeit of a different design, and two large low-rise buildings that framed the center's very large and windy plaza. 7 World Trade Center was a 47-office building that was developed after the completion of the center and was connected to it with a very striking stainless-steel-and-glass cylindrical skywalk. It collapsed in the aftermath of the terrorist attack apparently as a result of fires started when the twin towers collapsed. Architecturally, the World Trade Center was a bit bland and sterile, especially in its interior spaces, and the rationale behind building a pair of twin towers rather than a staggered group of three or four or just one giant tower never clear. But if the bulk and form and location were questionable, there was no denying that their proportions and, more importantly, their facades, were truly stunning and a worthy attraction for the return of King Kong, whose original trip to New York centered on the Empire State Building, which now is once again the city's tallest landmark. Should the center be rebuilt? Larry Silverstein, the owner of the World Trade Center and the nearby 7 World Trade Center skyscraper, announced his intention to rebuild and suggested their replacement with perhaps four medium-size towers. His determination to rebuild is a laudatory example of New York's indomitable spirit, but four more medium-size towers would not adequately memorialize the tragic events nor give the city comparable icons. The remaining shard of the base of one of the towers is bent and should be retained as a striking sculptural memorial to those whose lives have been lost in this disaster. When the economy permits, the center's site should be redeveloped but perhaps only with one tower on the east rather than west side of the site to better fit into the city's skyline. An interesting possible design scheme would be that submitted by Frank Gehry and David Childs for a competition for a new headquarters near Times Square for The New York Times, a design that was withdrawn but very intriguing. Gehry has designed a metallic ribbony scheme for a giant waterfront museum for the Guggenheim Museum on the other side of Lower Manhattan just south of the South Street Seaport and the high-tech metallic skins of many of his recent designs are somewhat akin to Yamasaki's great facades at the World Trade Center. United Way and The New York Community Trust have established the September 11th Fund to mobilize resources to respond to the urgent needs of all victims and their families affected by these attacks. 100% of your contribution will be used to support victims and their families as United Way and The New York Community Trust are underwriting all administrative costs. Donations may be made online or by check. The New York State Hotline for Businesses Affected by the WTC Attack: 1-800-456-8369.
Business seeking aid can also contact the Federal Emergency Management Agency at 1-800-462-9029 and the Empire State Development Corporation at 1-800-ILOVENY which is operating the Business Resource Center at 633 Third Avenue, 8AM to 7PM weekdays and 10AM to 3PM weekends. Persons with information pertinent to the investigation can contact the FBI at 1-866-483-5137 or http://www.ifccfbi.gov. The hotline for information about victims is 212-560-2730. On Tuesday, September 18, President Bush recommended the website at http://www.libertyunites.org.